This tutorial describes how to create a text editor in Eclipse. An editor allows to modify data. It typically requires that the user explicitly performs a save action to apply the changes to the data. By default, Eclipse opens editors in the same shared area. 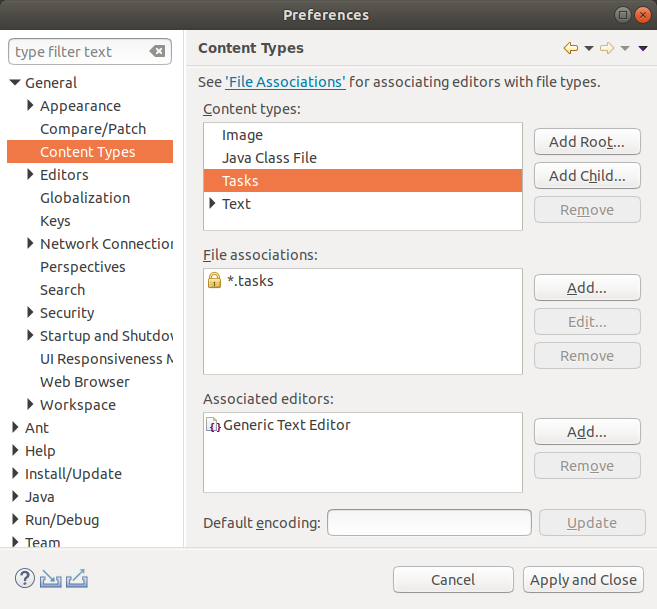 Reusing the generic editor is the preferred choice as of Eclipse 4.8 and will be demonstrated in the following exercises. The highlighting of source code can be archived by using an presentation reconciler. Such a presentation reconciler can be defined via an org.eclipse.ui.genericeditor.presentationReconcilers extension. It requires the specification of a contentType and a class, which implements the IPresentationReconciler interface. When using an IPresentationReconciler certain IRules can be applied for a specified content type. An IRule defines a rule used in the scanning of text for the purpose of document partitioning or text styling. While it is recommended to reuse the generic editor instead defining a new one, this is still supported. This chapter gives an explanation how this can be done. IEditorInput serves as the model for the editor. Eclipse will buffer IEditorInput objects therefore this object should be relatively small. It is supposed to be a light-weight representation of the model. For example the Eclipse IDE uses IEditorInput objects to identify files without handling with the complete file. The equals() of IEditorInput define the identity of the editor, e.g., it will be used to determine if an editor is already open or not. The editor receives the IEditorSite and the IEditorInput in the init() method. It must set the input via the setInput() method and the side via the setSite() method. init() is called before createPartControl() (which creates the user interface). Therefore you can use the input during your UI creation. If you define your own perspective, you can enable the editor area via the following code in your perspective implementation. By default, the editor will use the tooltip and title from the IEditorInput. Therefore you may want to change the title and tooltip in your Editor. Use setPartName() to set the title of the Editor and getTitleToolTip() for setting the tooltip. See Bug https://bugs.eclipse.org/bugs/show_bug.cgi?id=107772 for details on the tooltip. The method isDirty() determines if the editor contains modified data. For inform the workbench about changes in the dirty state you fired an event. You can open an Editor via the current active page. For this you need the EditorInput object and the ID for the editor which is defined in the "org.eclipse.ui.editors" extension point. If you hold down the Ctrl and click on an element in the Java editor you can navigate to it. This functionality is provided via extensions for the org.eclipse.ui.workbench.texteditor.hyperlinkDetectors extension point. The specified name is visible in the preferences under General Editors Text Editors Hyperlinking. The targetId points to the type of editor you want to support. If you want to use in all text editors use org.eclipse.ui.DefaultTextEditor. To target the generic editor use the org.eclipse.ui.genericeditor.GenericEditor target id. An IHyperlinkDetector is supposed to return an array of IHyperlink objects. The IHyperlink implemention performs the hyperlink action. Eclipse provides a page for the customizations of colors and fonts by the user under General Appearance Colors and Fonts. To define an entry for this page, you need to define an extension for the org.eclipse.ui.themes extension point. For example, you can provide a category, font and color with the following entry in the plugin.xml file or your plug-in. The preference can now be changed via the user or via the CSS engine. To get the current value you can use the IThemeManager. The org.eclipse.ui.workbench.texteditor plug-in provides the option to register a custom spelling engine via the org.eclipse.ui.workbench.texteditor.spellingEngine extension point. In this exercise you associated files with the tasks extension with the generic text editor in Eclipse. Within this file, you want to supported editing property files as for example. Create a new plug-in project called com.vogella.ide.editor.tasks and add the following dependencies to its manifest. The resulting MANIFEST.MF should look similar to the following. Bundle-versions have been removed as they change to frequently. Select in the MANIFEST.MF the Extensions tab. Add an extension for the org.eclipse.core.contenttype.contentTypes extension point. Use the Add button for this. Right-click on your new entry and select New content-type. Specify a content type for files with the .tasks extension. Your plugin.xml file should look similar to the following listing. This content type can be associated with a certain editor. The org.eclipse.ui.editors extension point can be used for this. Add the org.eclipse.ui.editors extension. Right-click on your org.eclipse.ui.editors, and select New editorContentTypeBinding to define this. You should have at least two entries in the extension tab. If you are using a product, add your new plug-in to your feature and start a runtime Eclipse via the product. Otherwise, update the launch configuration directly to ensure you new plug-in is included in the start. Start a runtime Eclipse which contains your new plug-in. Ensure that you content type is visible in Window Preferences General Content Types. Create a new project and a new file with the .tasks extension. If you open the file, it should open in the generic text editor. Use the Plug-in Spy Shift+Alt+F1 to see the editor class, it should be the ` ExtensionBasedTextEditor` class. To use the Plug-in Spy in your runtime IDE, add the org.eclipse.pde feature to your product. Ensure you start via the product. Associate the .gradle file extension with the generic editor. If you have Gradle installed into your IDE, ensure that you do not include it into your runtime IDE. Ensure that .gradle files open in the generic editor. In this exercise .tasks files you implement syntax highlighting for your editor. Continue to work in the com.vogella.ide.editor.tasks plug-in. Implement the following class to define a IRule. Implement the following PresentationReconciler as your reconciler. Add the an extension to the org.eclipse.ui.genericeditor.presentationReconcilers extension point to the plugin.xml file of the com.vogella.ide.editor.tasks plug-in. Restart your runtime Eclipse and open your file. Enter a few property values in the file. This exercise requires that you associated the .gradle file extension with the generic editor. Use two SingleLineRule to highlight quotes, string between '' and "", e.g., 'doit'. Use a NumberRule to highlight numbers. Implement your customer rule GradleKeywordRule extending WordRule to identify at highlight the words allprojects and apply. This requires your custom IWordDetector implementation. Use WordRule#addWord in your GradleKeywordRule constructor for adding words. Ensure that .gradle files open in the generic editor. Create the following file and check that your syntax highlighting works. The result should be similar to the following.